An awful lot of what is going on in the world at the moment seems to make little sense. 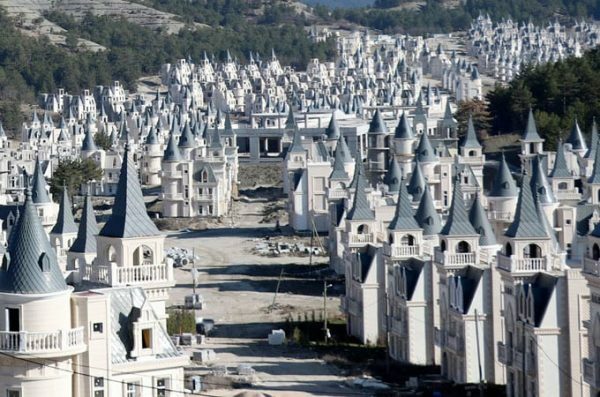 This is Burj Al Babas a development of 732 identical chateau-style villas in the picturesque mountains of northern Turkey which has reportedly gone bankrupt with $27 million of debt. The project was targeted at customers from Qatar, Bahrain, Kuwait, United Arab Emirates and Saudi Arabia. These photos, with their large OMG factor, ask more questions than they answer. What is the point of this unsustainable eyesore? 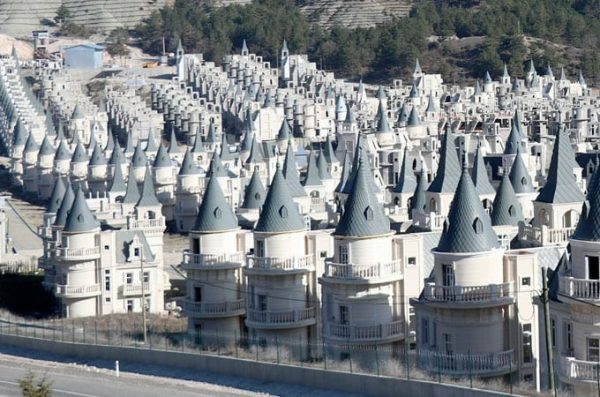 Visitors from the Gulf are supposed to fly in and relax in a development of identical Disneyesque houses, crammed together with no regard to context. It doesn’t work architecturally, ecologically or even financially. Is the world of the very rich a theme park? I don’t do any work for the ‘volume’ housebuilders here in the UK. For the most part they use ‘standard’ house types which are ‘tweaked’ in terms of the external materials to provide a bit of regional character (brick, stone, render walling / clay tile or slate roofing etc). They are site specific in terms of the mix of house types and the estate layout. But at least they serve their market and provide ‘real’ homes. I do one off houses and house extensions, usually to character homes, where context is all important. Set in its dramatic mountain forest landscape the Burj al Babas development could have been an exemplary sustainable development referencing the local Ottoman tradition of wood frame construction. A newly built radio telescope operated by a Canadian team of astronomers has detected a second repeating source of radio waves known as fast radio bursts (FRB) that travel at the speed of light. FRB 180814, as they have called it, appears to originate about 1.5 billion light-years away. FRB’s were thought to be one offs but now that two repeating sources have been discovered the hunt is on not just for more but for a theory of what they are and why they are repeating. Who knows what it is, but I know what it isn’t. It isn’t the extraterrestrial life or alien spaceships that are already being talked about. I’m pretty sure if extraterrestrials wanted to be in touch they’d have been in touch by now in a more obvious way. But there is something so human and imaginative in the belief that we are not alone, we are not all there is and there is something bigger out there. The classic post-apocalyptic novel, ‘On the Beach’ (1957) by Nevil Shute is set in Australia where a group of characters await their certain end with the arrival of deadly radiation spreading towards them from the northern hemisphere following a nuclear war. All human life in the northern hemisphere has been wiped out but a glimmer of hope emerges when a faint morse code signal is detected coming from an abandoned navy communications school in Seattle. 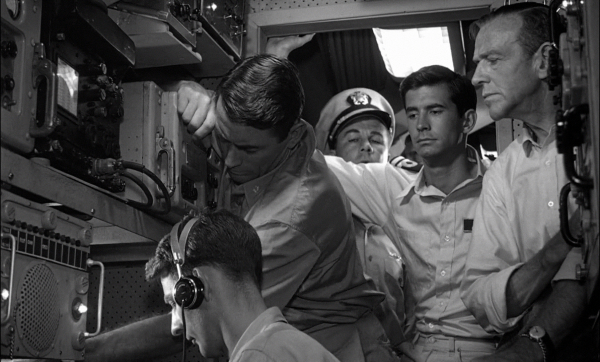 The submarine USS Scorpion is dispatched to sail from Melbourne to establish who is sending the signal and how they survived. Upon arrival Lieutenant Sunderstrom is sent ashore with a protective suit and oxygen tank. He finds that the mysterious radio signal is the result of a broken window frame swinging in the breeze and occasionally hitting a transmitting key. 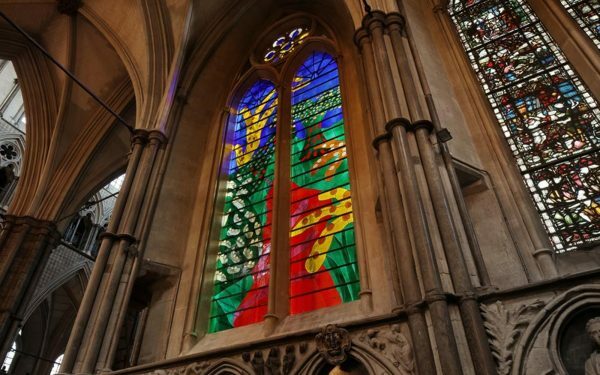 Was David Hockney having a laugh with his iPad design for the recently unveiled Queen’s Window at Westminster Abbey depicting a ‘country scene’ to commemorate the reign of Queen Elizabeth II? I mean it has garish colours and is totally out of scale and out of context with the gothic stone window frame, the north transept and the Abbey itself. It’s not in tune with the ‘spirit of place’. He probably wasn’t having a laugh. This is what he does and I get it – the whole point is that it is out of scale and context and the colours are intended to scream out like a neon sign. What I can’t decide is whether the choice of Hockney rather than a leading contemporary stained glass artist was dumb or inspired? Was this a totally bonkers choice and process where, like in the tale of the emperor’s new clothes, nobody felt able to state the obvious given that the Dean of Westminster and the Queen were involved or am I totally out of touch with the role of contemporary art in historic settings? It has been predicted that the coming scarcity of fossil fuels will cause significant problems for transportation, power and the production of food and manufactured items. But this recent study in Nature Climate Change suggests that the accelerating spread of renewable energy together with energy efficiency and climate policy may be substantially reducing demand to the point where a global financial crisis could be triggered not by a lack of fossil fuels but by a global wealth loss of US$1–4 trillion in oil related assets left ‘stranded’ by reducing global demand for fossil fuels as the ‘carbon bubble’ bursts sometime in the next 15 – 20 years. 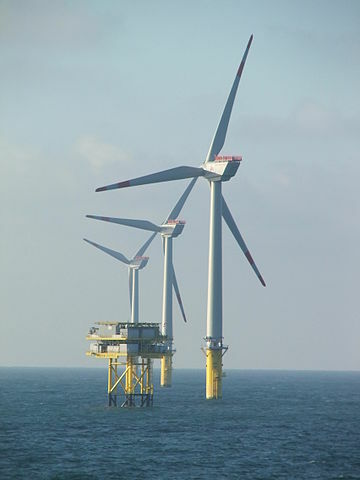 And this study in Nature Energy projects that by 2050 global energy demand will be around 40% lower than today – despite rises in population and income and growing global economic activity. So potentially no return to horse drawn carts and manual farm labour and a real hope for a clean energy future. It’s all moving very fast with renewables but not fast enough to deter the fracking industry which remains intent on making a final fast buck at huge environmental cost before everyone finally wakes up. Cuadrilla (known in these parts for their involvement at Balcombe) have applied for final consent to frack (not just test drill) at Preston New Road in Lancashire. The economics of shale oil don’t add up – leveraging cheap debt to make money in the short term for insiders at the expense of losses for long term investors. It would be tempting to think that the investors had it coming except that it’s all of us one way or another through our pension funds etc. You couldn’t make it up (unless it’s a fake painting)! 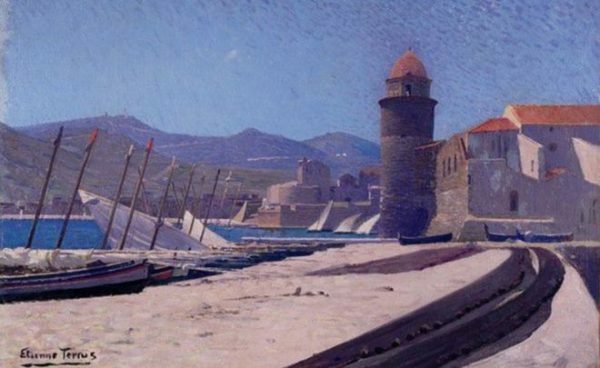 The Terrus Museum in Elne near Perpignan in Southern France has discovered that more than half of its collection of paintings attributed to local Catalan painter Étienne Terrus (1857-1922) are fakes. 82 fakes have been identified and only 52 paintings have been authenticated. If they don’t know what a Terrus painting looks like in his home town what are visitors supposed to think? 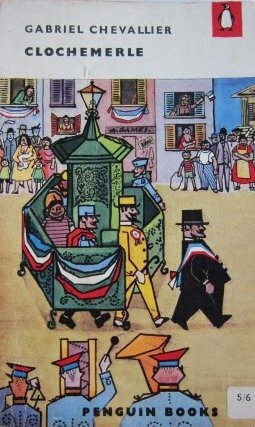 It sounds like the plot for a French farce or a sequel to Gabriel Chevallier’s classic comedy ‘Clochmerle’ and what a great addition to the French comedy tradition a book or film based on the story would be. The basic outline (all true) would be: The town spends an estimated £140,000 over 20 years acquiring the works. Local community groups raise funds and take donations, municipal funds are provided and some works are bequeathed by a private collector. £265,000 is spent on refurbishing the museum which is due to reopen. Before the opening guest curator Eric Forcada raises doubts about the authenticity of the paintings so a commission of experts is appointed who conclude that more than half the museum’s collection is fake including paintings that depict buildings that didn’t actually exist in Terrus’ lifetime and others where the signature is readily wiped off. Yves Barniol, the mayor says “a catastrophe …it’s intolerable and I hope we find those responsible”. Marthe-Marie Coderc, president of the local association Friends of the Terrus Museum, says “Maybe we were a little naive”. One good thing is that the museum with its 52 authentic works in now ‘on the map’. In my imaginary book or film version the writer would add a comeuppance for the fakers and a happy ending featuring a big street party with flags and a brass band etc. 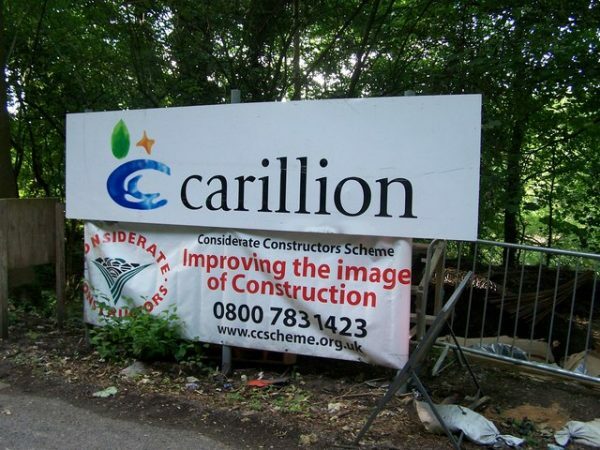 The press, media and many MP’s are running around with a sense of righteous indignation over the collapse of Carillion – the construction, maintenance and facilities management company. The trouble is they don’t know who to direct it against. Has the government messed up – or has it done rather well to get projects constructed this cheaply? Is the company to blame for poor management – or is its demise the inevitable result of contracts that lump massive risks onto single contractors with wafer thin margins? Carillion had become more or less an arm of government. Is this purchaser / provider model a good one or should these services be brought back ‘in house’? The fact is that Carillion was a Frankensteinian monster created out of disparate parts in response to government policy in the form of the PFI / PF2 private finance approach to the procurement of infrastructure and services. Except that Victor Frankenstein’s project started out with a noble motive which PFI never did. Carillion’s liquidation coincides perfectly with a report into PFI / PF2 by the National Audit Office which doesn’t come to any definitive conclusions but states bizarrely, even after all these years, that ‘(the) overall performance of PFI has not been quantified’ and ‘HM Treasury has noted that the higher cost of private financing means that the economic case for the model rests on achieving cost savings in the construction or operation of the project; or through the delivery of a qualitatively superior project’. For all its numbers, graphs and charts one thing the National Audit Office can’t quantify is the sheer ugliness of the buildings. 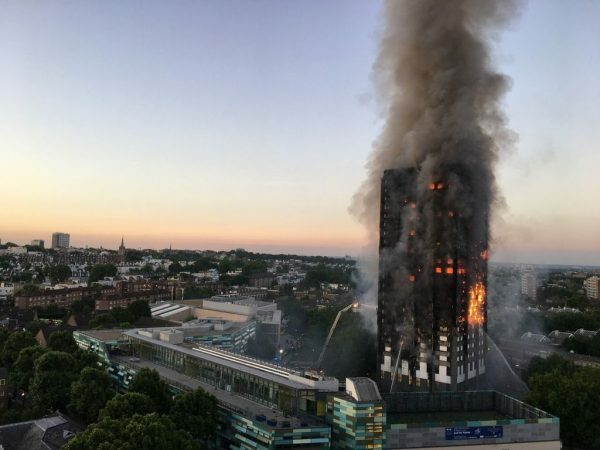 Badly designed by architects on a limited service and a tiny fee and poorly constructed of cheap materials, PFI / PF2 projects stand as a damning indictment of where we are as a society in every way. Whatever the savings have been in the past the government is going to have to pay more in the future and an awful lot more now to get these particular projects finished by someone else. An audit will be needed to establish what stage the work has reached and the true state of the partially completed work. Another contractor will need to be found who will want more money than Carillion was expecting plus a premium to make a suitable team available at short notice. There has been just too much politics involved in the delivery of public infrastructure for too many years. The return of a traditional and common sense approach is long overdue. The mainstream media seems to be getting dafter and dafter – perhaps in an effort to keep up with what passes as ‘news’ online. Take the latest ‘news’ that the new aircraft carrier HMS Queen Elizabeth, which is undergoing sea trials, has been leaking. Read on and it transpires that this is a faulty seal in a propeller shaft which is scheduled for repair while she is ‘alongside’ at Portsmouth. The repair will take a matter of days and be carried out by the shipbuilders at no cost to the navy and with no impact on the sea trials. 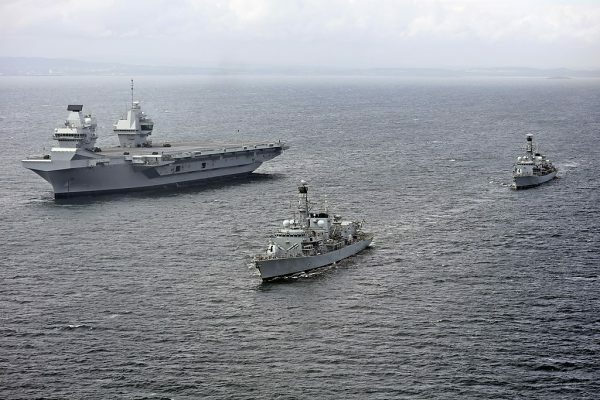 HMS Queen Elizabeth is the largest warship ever built for the Royal Navy, she pushes the boundaries of cutting edge technology in many respects – but that was last week’s news. A minor snag, discovered during sea trials in a ship of this size is not news at all. In fact I’d be more worried if the technology used in such an important project was so ‘safe’ that there were no snags. In the same way every architect designed building is a ‘one-off’ – responding to the client’s needs, budget, site, wider context etc. If there hadn’t been innovation with the attendant risks we’d still be living in caves. 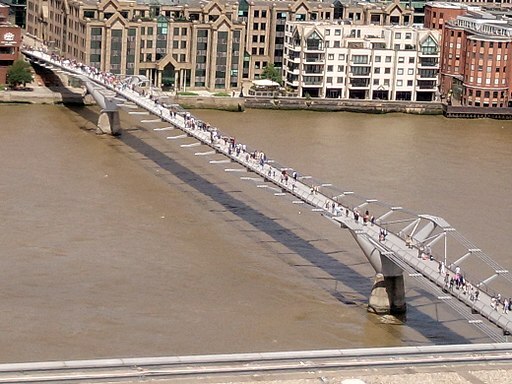 My favourite example of the value of taking a risk is the delightful Millenium footbridge (the ‘wobbly bridge’) which crosses the River Thames between the Tate Modern and St Paul’s Cathedral. The ‘blade of light’ design by Arup, Foster and Partners and Sir Anthony Caro initially suffered from lateral vibration caused by pedestrians crossing the bridge exacerbating the ‘wobble’ by matching their steps to it. The problem was solved at no cost to the client by the introduction of various ‘dampers’ to control movement. The bridge now looks impossibly slender – as it was intended to. If the designers had designed a risk free bridge at the outset, based on known technology, it would have been a lot more ‘clunky’ and less elegant than it is. 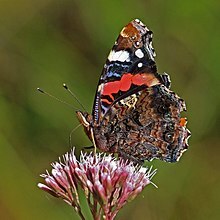 My career as a butterfly collector lasted the length of a childhood summer afternoon during which I netted, I think, a red admiral, a small tortoiseshell and a cabbage white before losing interest and becoming somewhat remorseful. I remembered this little armageddon when I read about the ‘ecological Armageddon’ for flying insects that is currently being reported in the press. 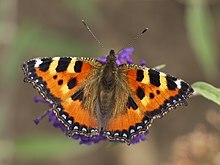 A 75% decline in 25 years in the total biomass of flying insects has been measured in nature reserves across Germany. More research is needed but if such a decline is for real and repeated across Europe it will have a disastrous effect on the ecosystem – including crops. Step forward an unlikely hero – Michael Gove – who as environment secretary has just confirmed that the UK will support a ban on the use of neonicotinoids which is the group of neuro-active insecticides, chemically similar to nicotine, credited with the massive decline in the bee population. Hopefully he will move on to ban the array of other dangerous pesticides used in modern agriculture but Gove is not a believer in ‘experts’ (famously pronouncing during the EU referendum campaign that ‘people in this country have had enough of experts’) so might take no heed. He is not a believer in architecture either claiming as education secretary that the schools building programme was wasting money with architects ‘creaming off cash’. He went on to ban curves and reduce space for corridors, assembly halls and canteens in the ghastly standardised designs that he championed. Let’s hope that as environment secretary he turns out to be more of a lover of the natural environment than the he was of the built environment when education secretary.